I have been a part of the BPO industry since 2004, wow I just realized that it will almost be 10 years in total! The first International BPO I joined in 2005 had a strict dresscode that required us to be in Business Dress up from Mondays to Thursdays. I remember at that time all I had was one pair of black leather shoes from my college days and a few good outfits to spare and since I had to keep up with the dress code, I found myself going around a small ukay ukay store in Arayat, Cubao. I have been relying on Ukay Ukay (thrifting) thereafter. Some find it absurd, others are pretty proud, just like Chynna Ortaleza who shops at Fashion Deelite in Araneta, Cubao. The same store I scored a pair of Steve Madden pumps. I will always be a fan of the Ukay and proud to show off, what I can put together. I am a confessed fashionista that likes to dress up for work and I actually get my inspiration from magazine's like Cosmopolitan, Mega, Vogue and fashion blogs too. So here I am showing off an Ukay ukay outift, proudly thrifted. I love sweater dresses, I have quite a few. 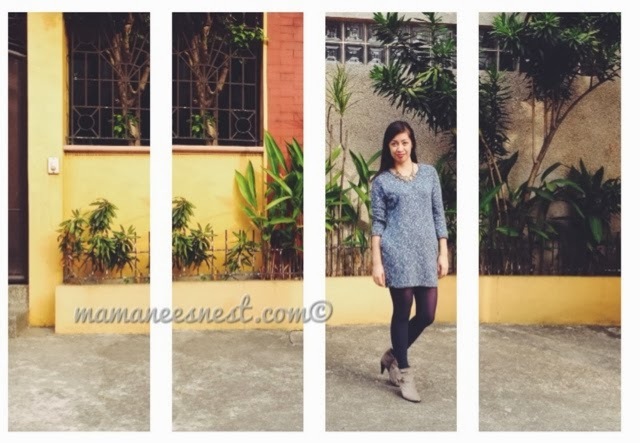 This sweater dress was picked out by my good friend and Kumare Ana, during our thrift shopping stint in Anonas. It's comfy, not so figure hugging and warm enough to sustain the chilly office airconditioning. I got this for around Php200. The blue opaque stockings were a steal at the price of Php15 at Kabayan Thrift store in Marikina. Now, this is a find that I am absolutely proud of, these italian ankle boots made of suede leather, had scored also in a thrift shop in Marikina (store is now closed, waaahh!) and got them for only Php450. I have received several praises including from my boss for this pair. They are so dainty with the ribbon, don't you think? So I have this whole outfit just for Php665 in total. Which usually is the price for a regular top at a mall retail store! My job as a BPO trainer requires me to dress up and with Ukay Ukay around, I'll be happy to oblige. Oh and it makes my inner kikayness happy too! Hehe. I'll post more ukay finds soon. Do you have any ukay finds to share? Please let me know in the comments below and let's share our ukay secrets! Hey there! Wooowww would love to see your ukay posts!